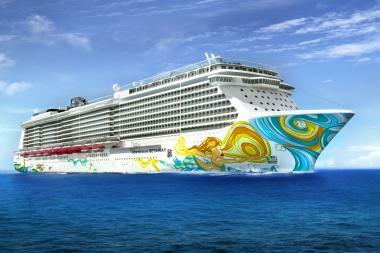 The Norwegian Getaway will become the Bud Light Hotel for the Super Bowl. HELL'S KITCHEN — A massive Bud Light party boat will dock along the West Side over Super Bowl weekend — brewing up alarm among locals who fear it will send thousands of drunken, noisy revelers spilling into the area. The 4,028-person Norwegian Getaway cruise ship — christened the Bud Light Hotel for the weekend — will dock at Pier 88 from Thursday, Jan. 30 to Monday, Feb. 3, housing thousands of football fans who plan to party in the city for the big game. The ship — which will be filled with Bud Light partners, VIPs, and members of the general public who won tickets — will also host a series of concerts featuring the Foo Fighters, Imagine Dragons and The Roots in a parking lot across from the Intrepid Sea, Air & Space Museum. “We’re concerned about the diversion of our fire people, our police officers, as well as the noise that will inevitably irritate people," said Jean-Daniel Noland, a Community Board 4 and West 47th/48th Street Block Association member at a recent board meeting. Locals are still smarting from the Pier of Fear concerts, a series of electronic dance parties over Halloween that pumped loud music throughout the neighborhood and drew drunken partiers. "The noise level does reach everybody," Noland said. In addition, locals are angry that Community Board 4 was never notified about the event. "We are upset that we never heard of this," said CB4 chairwoman Christine Berthet at Monday night's meeting, after officials got wind of the plans through media reports. CB4 officials said they now want the Economic Development Corporation, which manages the pier, to tell them the details. "One of the problems is that we don't know much," said Elke Fears, president of the 47th/48th Streets Block Association. "If you know what to expect, you can prepare." The EDC directed questions to Bud Light brewer Anheuser-Busch. Anheuser-Busch did not respond to requests for comment. The city's Office of Citywide Event Coordination and Management, which is coordinating many of the Super Bowl XLVIII events, did not respond to a request for comment. The Bud Light ship, which is officially named the Norwegian Cruise Line's Norwegian Getaway, recently finished construction in Germany and will spent time in Holland and England before sailing to New York. With that many extra people in the neighborhood, locals said they were bracing for the worst. "Noise, noise, noise — it’s the fear that we have with any of these clubs that open up, it’s people going, getting drunk, making a lot of noise late at night. If the concert is open-air, it’s even worse than if it was on the pier," said Fears. "It could be a long four days."